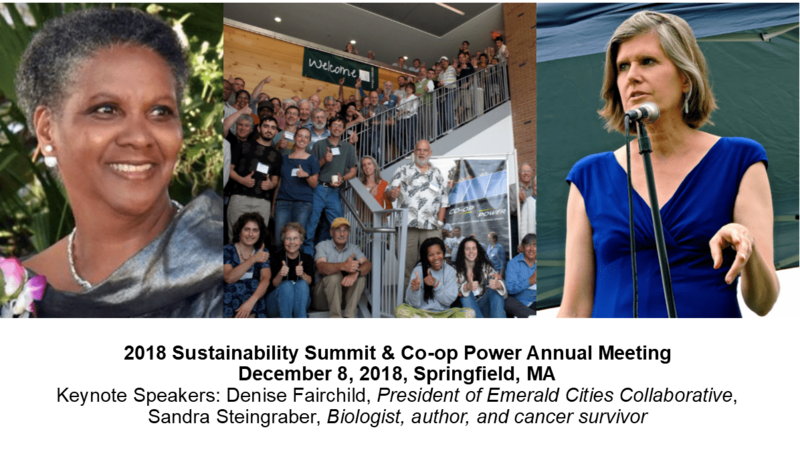 Co-op Power along with a number of local organizations have organized a Sustainability Summit in Springfield, MA on Saturday, December 8, 2018. We expect vibrant discussions about our society and our environment centered around our theme, “Energy Democracy”, with two keynote speakers and workshops throughout the day. If you are passionate about the environment and social justice then you have a place at the Summit to add to the excitement and expertise! Highlights are two keynote presentations: Denise Fairchild, President of Emerald Cities Collaborative, who works to green our cities, build resilient local economies and ensure equity inclusion in both the process and outcomes of a new green and healthy economy. Sandra Steingraber — Biologist, author, and cancer survivor — speaks about climate change, ecology, and the links between human health and the environment. Features include a tour of Wellspring Harvest, a quarter acre hydroponic greenhouse in Indian Orchard growing greens and herbs and information about Wellspring Cooperative a non-profit that is building a network of worker-owned co-ops to provide jobs and wealth building opportunities in Springfield’s underserved communities. Workshops will take place on worker co-ops and how they are key to the solidarity economy, a hands-on workshop on how to talk about our changing climate effectively, and a workshop on how communities can use the concept of “community energy aggregation” to secure energy efficiency and renewable energy generation services for everyone within their town. Co-op Power is a decentralized network of Community Energy Co-ops (CEC) organized to to build a multi-class, multi-racial movement for a sustainable and just energy future. It has raised $10M in tax equity to finance solar for non-profits and community solar projects across New York and New England. They have been awarded a competitive bid for 2MW of low-income community solar in NYC and and have an 8 MW pipeline of solar projects under development. In a time of climate crisis and economic disparity, this network of Community Energy Co-ops is making a difference. Join us at TechSpring, 1350 Main Street, 5th Floor, Springfield, MA on Saturday, December 8, 2018 from 2:30-8:30 pm. Registration is free. Donations are accepted to offset the cost of the meal.